What kind of a woman would write “Heroine” on the occupation line of her census record? One named Annie. The Heroine of Niagara Falls. My alarm woke me up at 4:35am. Ugh. My first weather check showed that it was currently 39 degrees. My feelings of frigidness were exacerbated by the fact that I knew I was going to skip my morning cup of coffee. I had places to be. The first place was Niagara falls. The area around the falls are perpetually crawling with tourists. I thought that if I got there around sunrise, I may have a little better luck with pictures. I wanted to try to get one of me and Annie with the falls in the background. I knew a Canadian sidewalk would be my only option for the shot, so the less foot traffic the better. 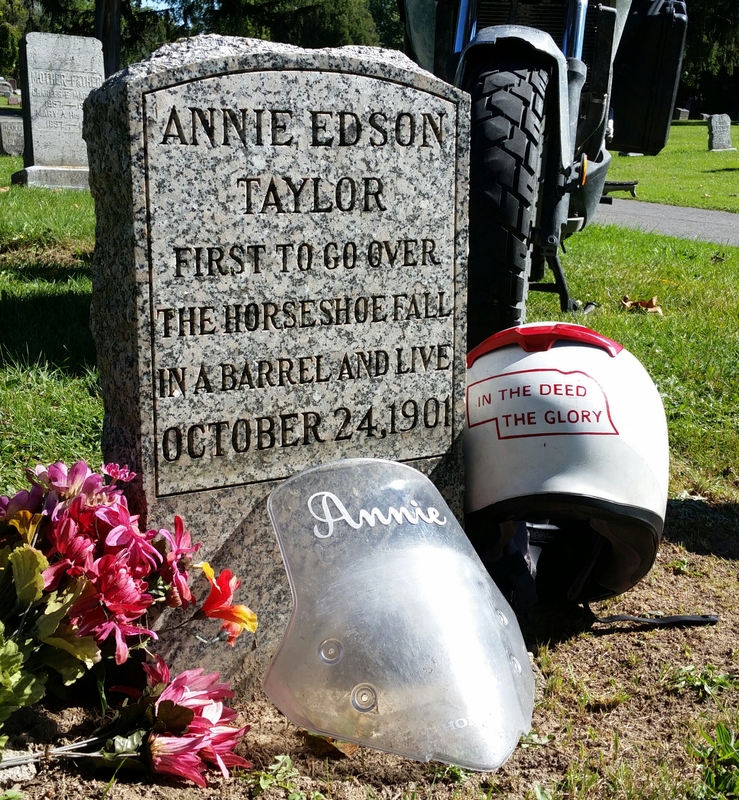 Secondly, I wanted to find and visit the grave of Annie’s namesake, Annie Edson Taylor. I had only owned Annie for 12 days the last time we arrived at the falls in 2013. 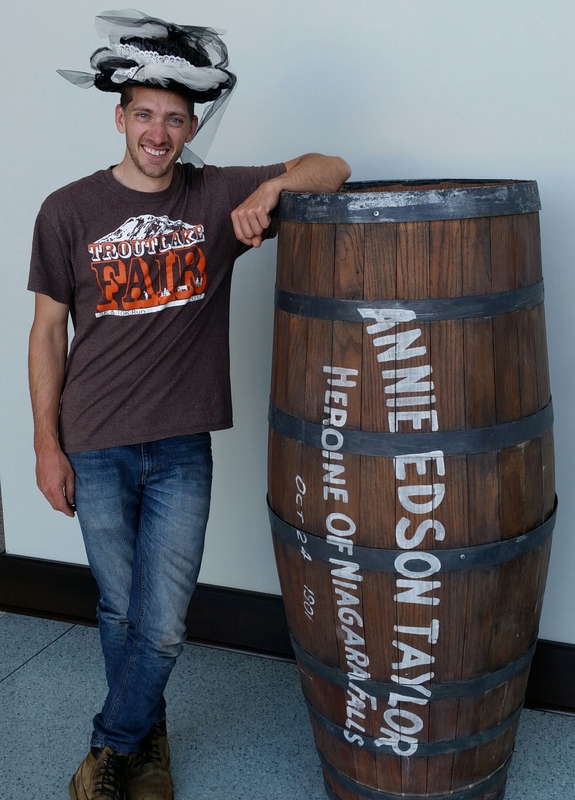 Every bike needs a name, so I named her after the first person to survive Niagara Falls in a barrel. Annie Taylor is buried at a cemetery near the falls, but I had no idea where to find her grave site. I wanted to budget plenty of time for this project. Packing up is tough when it is so cold. The dew doesn’t have a chance to evaporate, so it is hard to maintain feeling in the fingers for long. It was a little sad to say goodbye to my spot where I had lingered for 3 nights, sadder still to not utilize a free warm shower on a cold morning. See you soon canal! I immediately had second thoughts about my plan, since I would have over an hour of riding before any sort of twilight. There seemed to be deer warning signs around every bend. I tried to focus my attention on the ditches, rather than on how cold I was feeling. I made it to Niagara without any deer sightings, which was a releif. The sun was up but still low, as crossed over the Rainbow bridge into Canada for the last time on this trip. Maybe I should post a map. 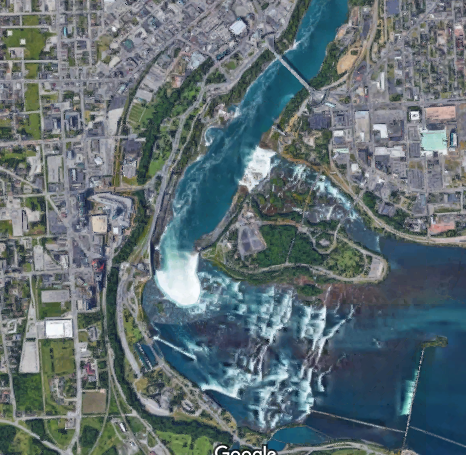 The Niagara River flows north between Lake Erie and Lake Ontario. 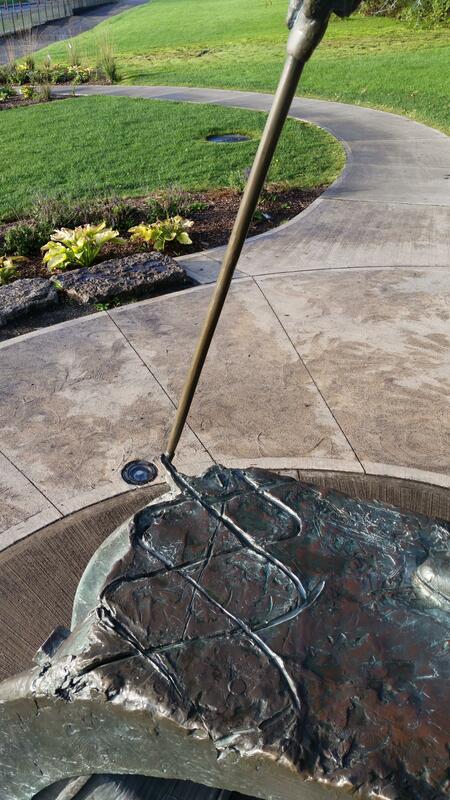 It also divides the US and Canada, with Ontario on the west and New York on the east. The American side of the falls is a State Park, which is really nice. The Canadian side, by contrast, is VERY commercialized. There were a couple of reasons why I was crossing to the Canadian side. First, the views are a little better. Second, I knew there was a road running right along a sidewalk where I might be able to sneak an Annie/falls picture. No such road exists on the American side. I was already getting “rained on” 6-7 blocks from the falls. Though the skies were clear, the mist from the water crashing down was being blown to the west. I traversed the road along the falls several times, looking for a place/opportunity for a picture with Annie. I thought I recognized a pattern in the passing patrol vehicle so I seized the moment. I drove Annie a number of blocks away from the falls and parked her in place that looked free. I returned to the falls on foot. There are no words to describe the falls. First, will be a gif that kind of shows the layout. The American Falls are straight across (a bit obscured by the rising sun) and I pan to the south showing the Horseshoe Falls (where Annie went over). 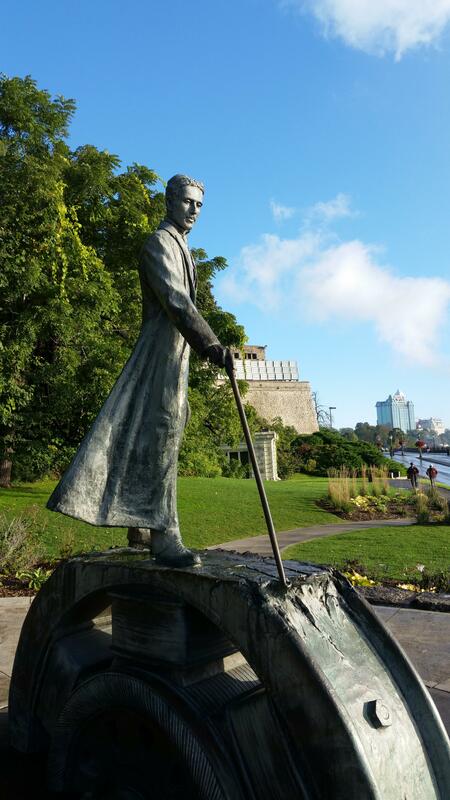 After soaking in the falls I went to see the Nikolai Tesla monument. 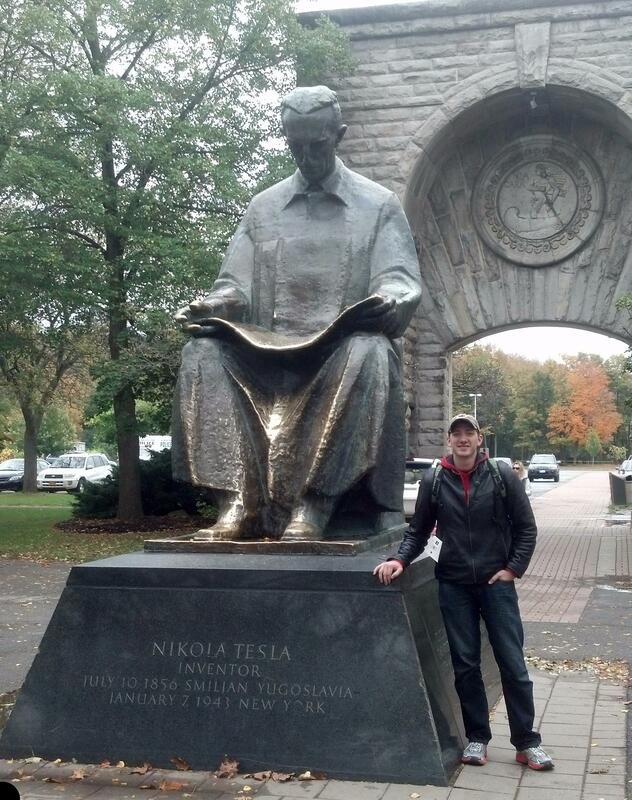 Tesla was one of the main reasons I wanted to visit Niagara in 2013. Indeed, I snapped this photo before even laying eyes on the falls. Hydropower was birthed by Tesla’s inventions. 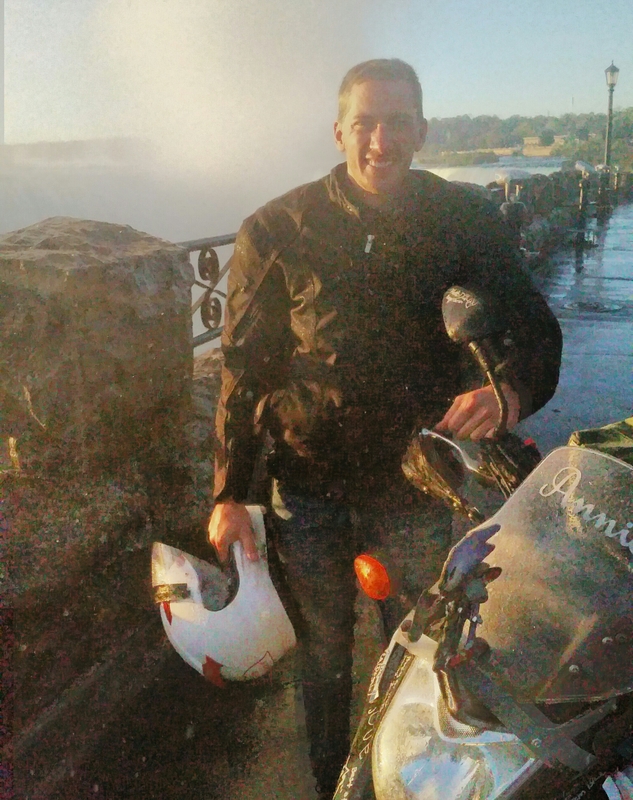 The Niagara River is an ideal spot to harness its power. The Canadian monument is great. It shows him sketching in the dirt a trio of sine waves, which is supposedly how the idea for the electric generator came to him. I’m tempted to jump into my full Tesla lecture at this point, but I think I can constrain myself. He’s gotten a lot more respect in the last decade or so and I hope that trend continues. I had one more stop before leaving Canada. 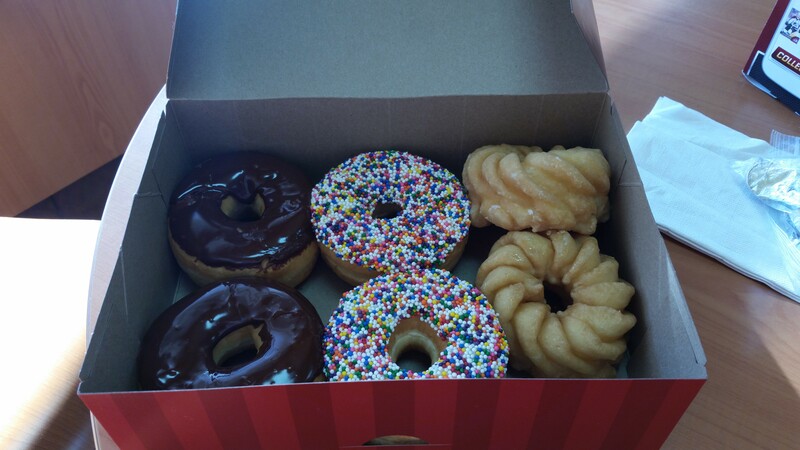 I needed another Honey Cruller. Plus I had some Canadian dollars to spend. One more turn at Tim Horton’s! I used the internet for awhile and worked on a few other things. It was not yet 11am and I had already had a full day. Time to make it fuller! I crossed back over to the US and navigated towards Oakwood Cemetery, the resting place of Annie Taylor. As I approached the cemetery, it appeared that I had a daunting task in front of me. I learned later that the cemetery covers 18 acres and has over 20,000 plots. The welcome sign showed that staff were only present on weekdays. However, I did notice some cars over by an office looking building and group of people standing nearby. Time to make some new friends! I scarcely had my helmet removed before I was greeted by a gentleman named Pete. 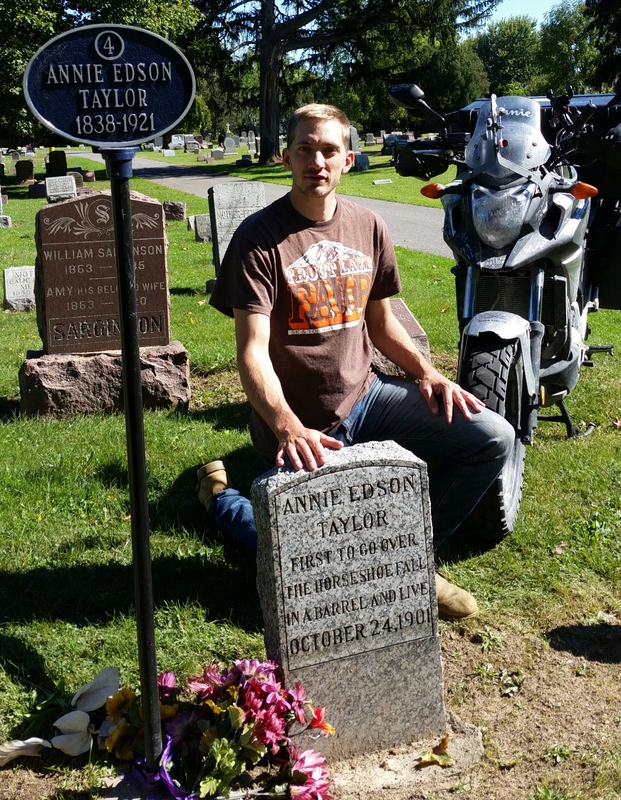 I told him that my motorcyle was named after Annie Edson Taylor and wondered if there was any way that he would know where to find her gravesite. I can only imagine what must have gone through his mind. It would be like giving Nikolai Tesla measurements for resistance and current, then asking him if he could find the voltage. The question would be borderline disrespectful. Pete was not a tourist. Pete was not just a resident of Niagara. Pete was not just a knowledgeable guy. Pete was the historian for the town of Niagara. 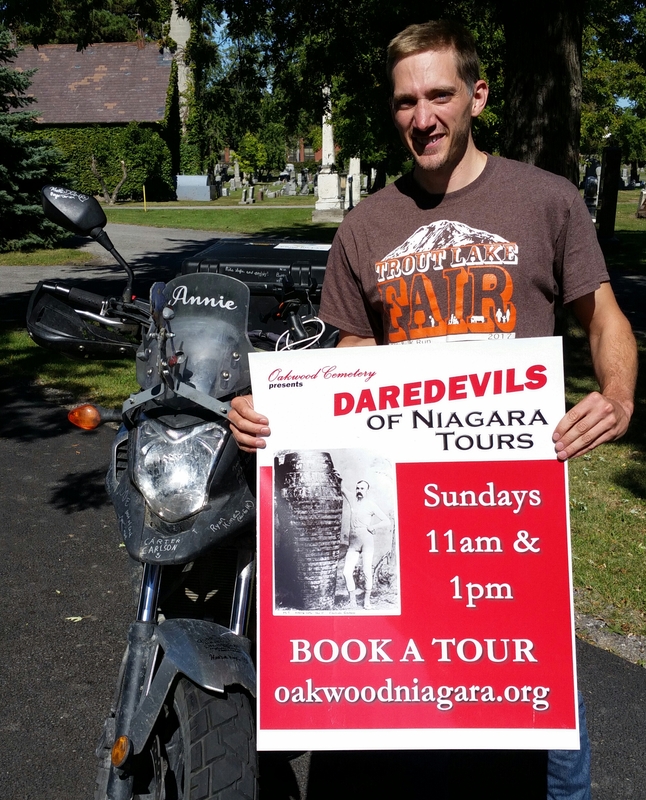 Furthermore, he informed me that they were just minutes away from beginning their 11am “Daredevil Tour” of the cemetery, of which a certain Annie Edson Taylor is the star. It is normally $10, but he invited me to come along for free. I was welcomed warmly by the rest of the group and I told them the brief version of what I am doing (“Hi, my name is Brett. I have no idea what I’m doing”….something along those lines). 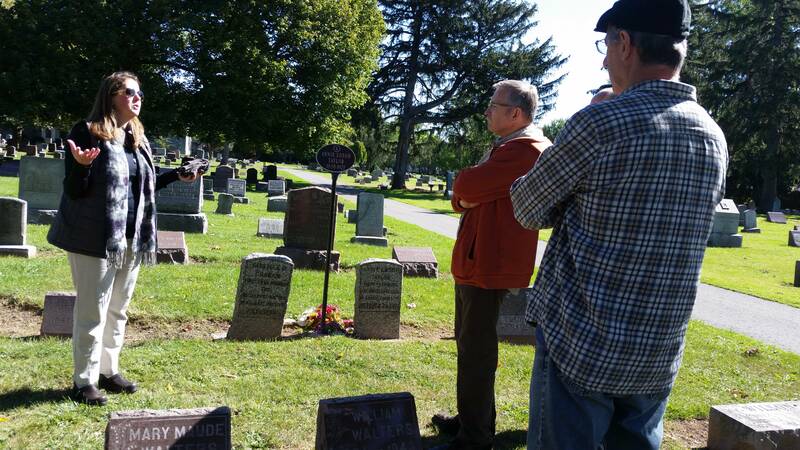 We saw gravestones and heard stories of those who had braved sections of the Niagara River by boat, barrel or body. Some of them found fame and recognition. Some of them just found themselves in Oakwood Cemetery. I didn’t think the tour could get any more interesting, but then it was Annie’s turn. I gotta be honest: Most of what I knew about Annie Edson Taylor’s life was what appears on her Wikipedia page. The story is so much deeper, compelling and convoluted than I could have ever thought. My new friend Pete actually wrote an account of her life and times which was awesome to read. He and Chris could answer any question that I had. Annie was fascinated by tales of adventure from her youth. An enterprising spirit clearly dwelled within her. She was both married and widowed at a young age. There was no life insurance or social welfare programs to ensure her financial stability. It seems that her whole life was spent just trying to keep her head above water. At the age of 62 she was living in Bay City, Michigan. Her biggest fear seemed to be living out her days in one of the county Poor Houses. It appears that she would do anything to avoid it. Upon hearing of the Pan-American Exposition taking place in nearby Buffalo, the idea of going over in the falls in barrel crystallized in her mind. She could achieve this amazing feat, then live off of the income that her fame would supply. Chris defined Annie as a “calculated risk taker,” just as I had said of myself. She designed the barrel herself and had a well thought out systems of weights, straps and padding to keep her safe. The timing was far from perfect for her stunt. 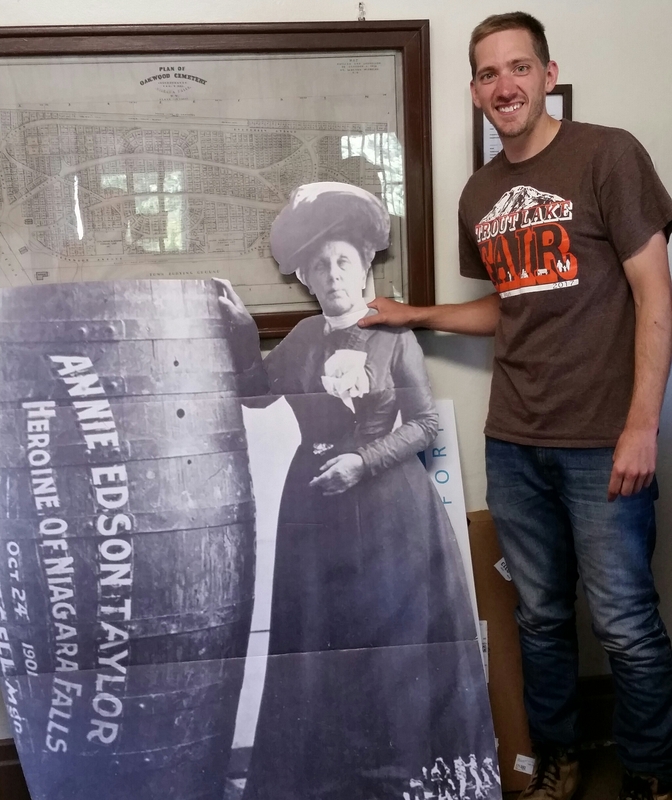 Recent events in the area included the assassination of President McKinley, as well as a woman, Maude Willard, dying in a barrel stunt on the Niagara Rapids. Still, she was not turning back. She completed the feat on her 63rd birthday. But things did not go as planned for Annie. Fame and fortune were not to be her fate. “Why” is the big question. I will not even attempt to answer that question here. Annie came to the end of her life in a county Poor House, just as she had feared. She was going blind and had no friends or family who could take her in. A sad, anti-climactic, end to and epic life. As I grow older, I find I have more respect for effort and less respect for success. The motto on the back of my helmet, “In the deed the glory,” attempts to capture this sentiment. One reason I have so much respect for Annie is that she was a “tryer.” Whatever her deficiencies might have been, effort was not one of them. As much as I wish her story had a different ending, I think her story might be less impactful had she found the fame and fortune she sought. Instead, we are left with a more gritty, realistic vision of how a life can unfold. For me, her life is a reminder to keep trying, regardless of how your efforts are perceived. However my story ends, I hope it will at least be said that I gave it my best shot. Success be damned. After the tour we took some more pictures and chatted. I got some good Annie swag. 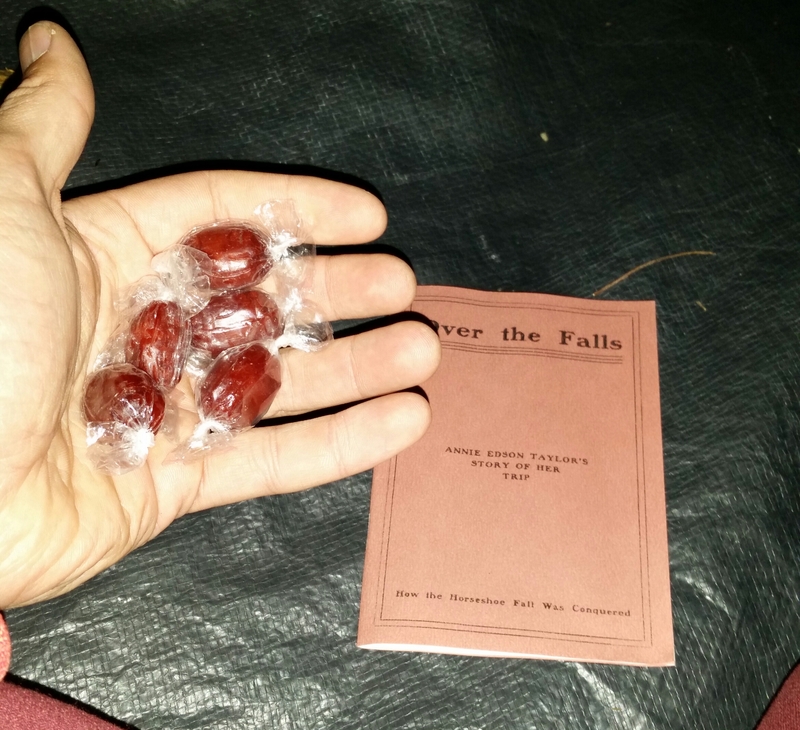 Root beer barrels and her original account of the trip that she would sell for a dime down by the falls. I also got a copy of the account that Pete (along with Michelle Kratts) had written on Annie’s life. It was a really informative, eye-opening read. As I was sitting by Annie’s grave, Pete drove up and invited me over for Sunday afternoon dinner. I told him no because I had already eaten multiple large, healthy meals that day. (Yeah, right) I graciously accepted his offer. Pete was hosting his brother Don and Don’s partner, Jim. They are from Chicago and had been along on the tour. Hearing that I was from Nebraska, Don asked me if I was part of the Swedish Mission Church. They are well familiar with North Park College in Chicago. The first stop for our quartet was at the new Amtrak train station. In the foyer there is a replica of Annie’s barrel. They asked me if I wanted to wear the hat too. What a ridiculous question. I soon met Theresa, who was hard at work fixing a wonderful meal. I had a great time chatting with them. They were so kind to me. Funny enough, it was the first time in 17 days that I had been inside someones residence (unless you count Murray’s RV). That might be a lifetime record for me. Annie got some more tattoos and we took a group photo. As I was leaving, Theresa slipped me $50. Wow. I was once again blown away by generosity. (The amount equates to 1,011.5 miles worth of gas money). What wonderful people. Oooff. How do I sum this up? I think I have said quite enough already! This was another detour that filled me with joy and wonder. I guess it’s not all about checking places of a list. Realtime update: Oh goodness, I’m feeling a bit behind again. This one took a long time to write. I’m heading to Chicopee, MA. I’ll camp somewhere in the area tonight and visit tomorrow. 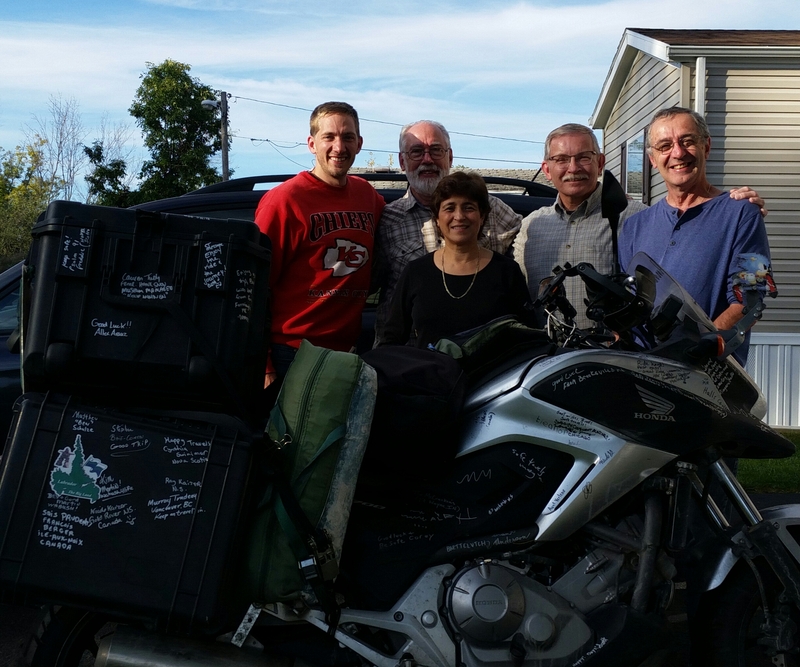 I had an incredible experience in Pittsfield, MA. This journey continues to surprise! Brett……Enjoyed reading your ‘Annie’ day account very much! Particularly since we were a part of your journey on this day. Succinct, thoughtful, descriptive writing! It was so great meeting you and hearing your story. Safe travels! Journey on and ‘write’ on! Thank you, Jim. Thanks also for being my photographer for the day. You took some great shots! I feel honored to have met you! Brett – Good day ! We read your posts after we listen to the evening news. What a beautiful breath of fresh air Your posts give us. Thank you. They reinforce our beliefs that there are many good people in this world, despite all the horrible news, showing all the evil. ” Hello ” to each other and if you are lucky, you can meet a new friend. Even if it is just for a brief encounter. We hope you get to see the Harvest Moon tonight…it is beautiful. I don’t know if there is a theme to this story yet, but that might be it. For all the evil we see on TV, I still believe that good is more powerful. I’ve been the recipient of so many gracious acts in my few months on the road. So nice meeting you at Oakwood. You are an inspiration! Wishing you safe travels on your journey and looking forward to following your progress. Yeah, it was awesome. It took a long time to get my thoughts in order on this day. So much happened! What great reads! You are a magnet for nice people! Hmmm…that’s a good question. I may have to pose that to the experts. I can only image how traumatic the event was for her, but she was a tough lady. The thought must have crossed her mind. Wow! What an honor to have your comment on my blog! I hope Annie would be honored to have a motorcycle named after. Thank you so much for the kind words!